With many local artists striving to find a creative outlet in Billings, several RMC students, alumni, and faculty have found a niche with Sacrifice Cliff Theatre Company’s 2015 New Works Festival. SCTC, created by Patrick Wilson and RMC alum Shad Scott, has been in Billings for two years. The company aims to give local writers, actors, directors, and artists an open and collaborative environment to present their work- as well an opportunity to explore their potential. 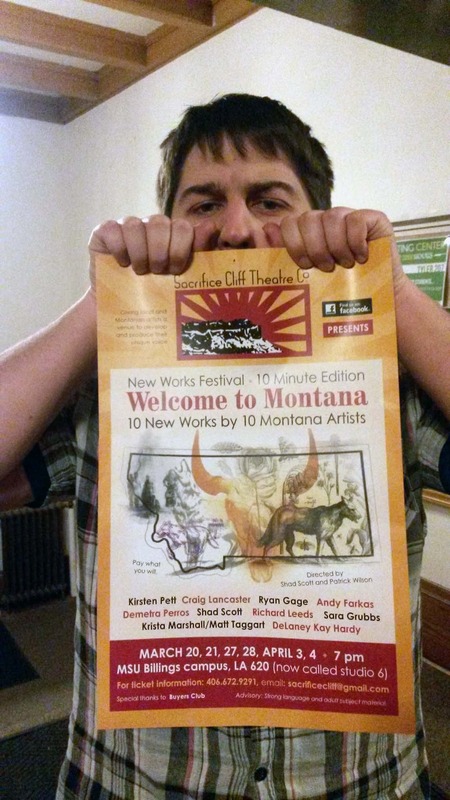 Sophomore Tucker Downs is one of several students collaborating on SCTC New Work Festival: Welcome to Montana. Wilson and Scott worked with many writers for the festiva– revising and editing pieces to really make them polished. “The writers have been the biggest, and best, surprise,” said Scott. “Some people really stepped up to the plate and hit it out of the park with their pieces.” Two of the writers include RMC Senior Richard Leeds and Professor of English Andrew Farkas. According to Leeds, having an outlet as a writer readily available can be hard to find in any town, let alone with a company willing to say, “hey let’s produce your play,” in such an encouraging way. “It’s not just ink on paper, you get to see it come to life,” he said. Other students collaborating with the New Works Festival include Sophomore Tucker Downs, and Seniors Teresa Sarkela and Kassidy Miller. Downs and Sarkela have been working as the design/technical crew on scenery, lighting, and production. Miller will be performing in several of the short plays, with characters ranging from a bovine bewildered college student in Leed’s work The Cow, to a true Montana girl who loves sky parties in Farkas’s City of Warehouses. “Sacrifice Cliff is always looking for more writers, actors, really anyone who’s interested in working in theater,” said Farkas. The Festival will be performed in studio LA-620 (studio 6), sixth floor of Petro Hall at MSU-B March 20 – April 4. Admission is “pay what you will,” meaning audiences can see all these Montana-inspired pieces for free or a donation of their own choosing. Visit Sacrifice Cliff’s Facebook page (Sacrifice Cliff Theatre Company) for more information. This entry was posted in Issue 15. Bookmark the permalink.